Eagle Energy Services and our sister company, Facilities Inc., can provide the necessary skilled staff to complete your specific project needs. 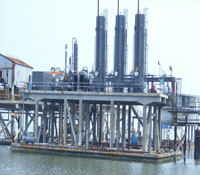 We are located on a 10 acre site with approximately 850’ bulkhead water frontage. 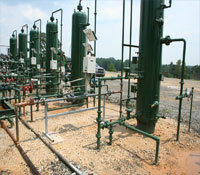 We also offer a 40’ x 120’ fabrication facility. PRODUCTION BARGES (STEEL OR CONCRETE) . 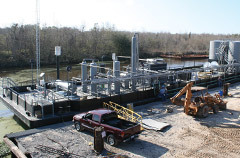 Eagle Energy Services LLC / Facilites Inc. offers (25) years experience in production barge fabrication for any type of well production application. We can supply all design, equipment and pipe sizing, pipelines, supervision, CAD drawings, complete construction and installation services. We also offer the opportunity to lease or purchase production barges to suit clients' specific well needs.